Giant Car Bows Make the Perfect Decoration for Halloween Themed Events! The spooky season is upon us. 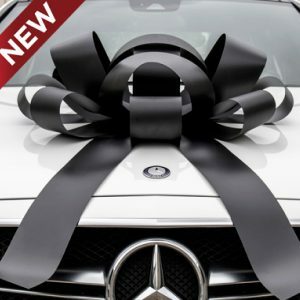 Give your customers a real treat this October when you order our Giant Car Bows. Customize your order and order our Giant Car Bows in orange, black, red, or any color combination that will make your event look festive and appropriately themed. Themed car bows are the perfect way to give your car dealership, retail store, event hall, or home a little extra spice this October. Placing a giant orange and black car bow on your vehicle or on an appliance inside of your home will add the perfect finishing touch to your Halloween themed decor. Our car bows feature a scratch-resistant soft magnetic base that will stay in place in the wind, rain, or snow. The bows are made of a durable vinyl material that is intended for both indoor and outdoor usage. Our car bows are made of vinyl so they will withstand all weather conditions and will not be ruined if they get wet. While the car bows are hard-wearing, they will not cause paint chips, scratches, or any damage to the surface you place them on. Who doesn’t enjoy Halloween decorations, autumn leaves, and sweater weather? Your customers, friends, and family will love that you appreciate Halloween and the fall season as much as they do! Don’t miss out! You can only display your Halloween themed customized Giant Car Bows for a limited time. Order now and start decorating for October 31st as soon as they arrive!